Rhapsody, the music subscription service that recently broke away from former parent company Real Networks, has a shiny new 2.0 version of its iPhone client in the App Store as of Monday. Its marquee feature? The app now allows offline music downloading and listening, a feature the company tipped last month. 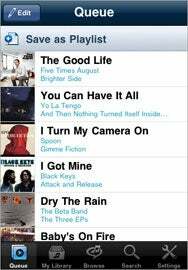 Now with Rhapsody 2.0, iPhone owners can create a playlist of any artists, albums, and tracks from the catalog, then save it to download all tracks for offline listening, in addition to streaming the over 9,000,000 songs via 3G and Wi-Fi. Users can rock out to their Rhapsody tracks as long as they maintain their Rhapsody subscription, which the company has now lowered to just $10 per month. Of course, one drawback of Rhapsody’s iPhone client is that it still can’t stream or even play music in the background while you use another app. Hopefully, when iPhone OS 4.0 brings multitasking later this year, Rhapsody will become an even better poster-child for music listening and subscription services on the iPhone. Rhapsody 2.0 is free (with a monthly subscription; a free trial period is available) and requires an iPhone, iPod touch, or iPad running iPhone OS 3.0 or later.